THURSDAY, June 2, 2016 (HealthDay News) -- Colon cancer patients who take low-dose aspirin may have a somewhat better chance of surviving the disease, a large study hints. Norwegian researchers found that among over 23,000 colon cancer patients, those who used aspirin were 15 percent less likely to die of the disease over the next several years. But these findings alone don't prove that aspirin prolongs colon cancer patients' lives. There could be other reasons that aspirin users had better survival odds, according to lead researcher Dr. Kjetil Tasken, a professor of medicine at the University of Oslo, in Norway. Still, he said, there is a large body of evidence that low-dose aspirin can help cut people's risk of developing colon cancer in the first place. In fact, recommendations from the U.S. Preventive Services Task Force say that adults in their 50s and 60s may want to consider taking low-dose aspirin to reduce their risk of colon cancer (and heart disease and stroke). What's unclear, Tasken explained, is whether people who already have the disease can benefit from adding aspirin to standard treatment. Based on the current findings, that possibility is "well worth pursuing," Tasken said. But he stressed that clinical trials -- where researchers directly test aspirin as a colon cancer treatment -- are needed to know for sure. Those trials are already underway, and Tasken said that patients should wait for the results before turning to aspirin on their own. Aspirin does have risks, including bleeding in the stomach or brain, the study said. The findings are based on records from more than 23,000 Norwegian adults. They were all diagnosed with colon cancer between 2004 and 2011. More than one-quarter were prescribed daily low-dose aspirin for more than six months after their diagnosis. And, most had been taking aspirin before their diagnosis, too. In Norway, low-dose aspirin is available only by prescription, at doses of 75 milligrams (mg) or 160 mg a day. It's usually prescribed for lowering the risks of heart disease and stroke, Tasken said. Overall, the study found, 66 percent of aspirin users were still alive after about three years. That compared with 58 percent of nonusers, the study found. The researchers tried to account for other explanations -- such as age, the severity of the cancer, and whether patients were taking other drugs to protect their hearts. Still, the survival benefit for aspirin users remained. When the researchers dug deeper, the benefit was concentrated among patients who'd been taking aspirin before their diagnosis: They were 23 percent less likely to die of colon cancer -- and 14 percent less likely to die of any cause -- than patients who did not use aspirin at all. An expert not involved in the study said it raises an "interesting scientific question." That is, do aspirin users tend to develop less-aggressive colon cancers, and why? 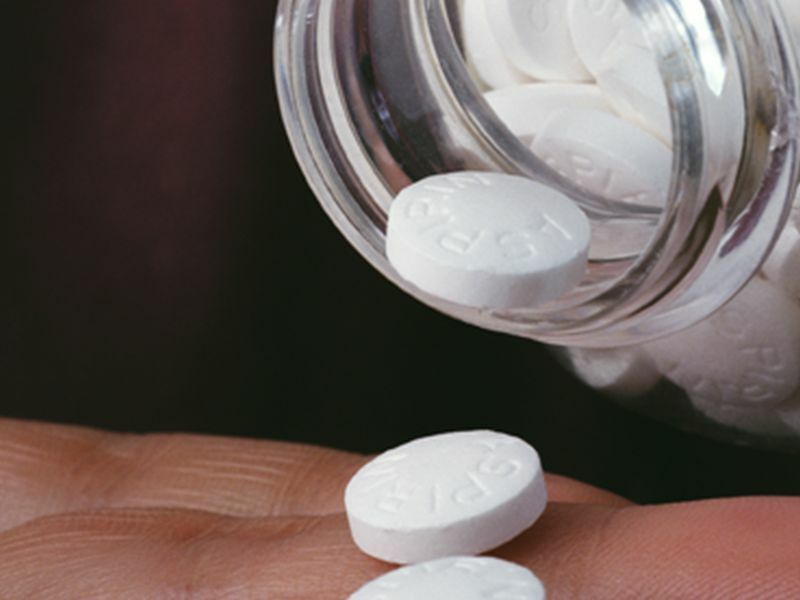 But the results "do not necessarily mean that people with colorectal cancer will benefit from taking aspirin," said Eric Jacobs, strategic director of pharmacoepidemiology for the American Cancer Society (ACS). It's "biologically plausible" that aspirin could help treat colon cancer, based on lab research, Jacobs said. Aspirin inhibits blood cells called platelets, he explained, and there is evidence that "activated" platelets can encourage tumors to grow and spread. But Jacobs agreed that everyone needs to wait for the ongoing clinical trials to wrap up. "Those trials should provide clearer answers in the next few years," he said. For now, Jacobs advised people wondering whether they should be taking low-dose aspirin: "Talk to a health care provider who can help you weigh the benefits against the risks." He also stressed the importance of colon cancer screening, to help prevent the disease or catch it early. "Whether a person takes aspirin or not," Jacobs said, "one of the best defenses against developing colorectal cancer is getting a screening test." People at average risk of colon cancer should start having screening tests at age 50, according to the ACS. Some tests, like colonoscopy, can prevent colon cancer by allowing doctors to find and remove precancerous growths called polyps.